The three major Indian nations in north­ eastern America were divided into three groups: the Algonquin, the Iroquoian and Siouan. The Siouan lived in the region of Lake Winnebago and Wisconsin, the Iroquois peoples lived to the west of the Algonquins and east of the Siouans in the area of New York, Pennsylvania and Ohio. The Algonquins occupied the coastal areas from North Carolina to Maine and out along the St. Lawrence River in Canada. These nations had different forms of gov­ernment, language, and social customs, but there were many similarities. They hunted and yet the wild animal was their brother. They used wild plants with magic incantations and yet understood the fundamentals of an agrarian life. In Virginia they raised tobacco which was traded as far north as the St. Lawrence. Copper from Canada found its way to North Carolina. Contrary to popular opinion, the life of these woodland people was not always one of total strife and warfare. While the Algonquin and Iroquois nations were in general hostile toward one another, a meeting between small groups or individuals was usually peaceful. War, by the white man’s definition, was unknown to the Indians. Assimilation rather than annihilation was practiced by conquering Indian tribes. The Indians who occupied the area of The White Mountains were known as the Abenakis. They were part of the Wabanaki Confederation which covered the region of the lower St. Lawrence River in Canada and northern New England. Referred to by present anthropologists as the North Atlantic Slope Culture, the Confederation formed six tribes: the Micmacs, Malecites, Passamaquoddies, Penobscots, Pennacooks and Abenakis. The Wabanaki Confederation was the most northern branch of the Algonquin family. The tribes had a basic unity, culturally and politically reinforced in part by their common enemy, the Iroquois in eastern New York. 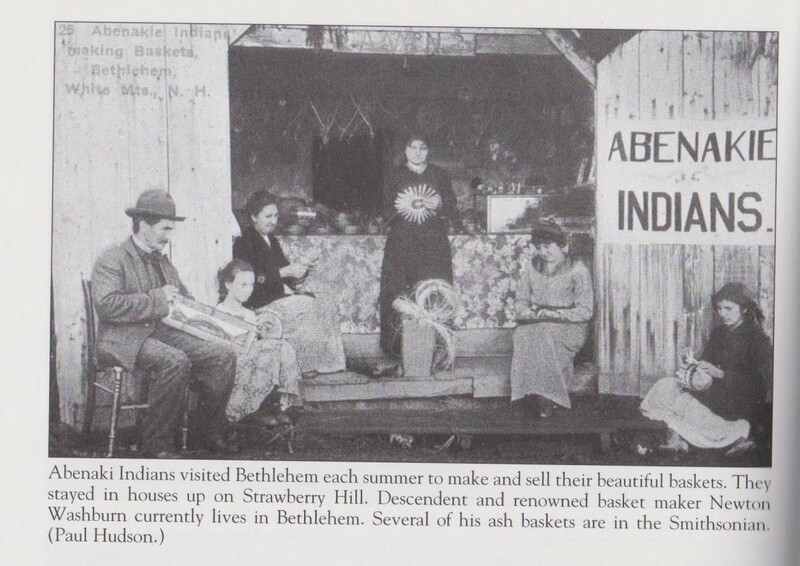 Our area, the town of Bethlehem, was within the hunting region of the Abenaki tribe. The local Abenakis, covering the general area of the White Mountains, were called “Ammonoosuc” which means “narrow fishing river.” Abenaki means “land the sun first bathes in light.” A major Indian trail passed through the town of Bethlehem more or less following the Ammonoosuc River. The trail began at the upper reaches of the Saco River in Maine, passed through Crawford Notch and joined the Ammonoosuc River which it followed to the Connecticut River. The Connecticut River was a primary north-south Indian trail leading from Long Island, New York to Canada. The Ammonoosuc Trail was a principle east­west Indian trail, following the present Route 302 , Ammonoosuc River and Littleton-Whitefie1d Road. Unlike the white man’s trails, the Indians’ trails meandered and crisscrossed along a basic route. Not meant to accommodate large populations or transport ox carts and wagons there was no need for trails to be wide and well developed. There is little information on the Indian occupation of the region of Bethlehem or the White Mountains. The harsh climate, with a growing season too short for Indian corn, no doubt discouraged permanent villages from being settled. However, anthropologists and old colonial records have documented that Indians did dwell on the present sites of the nearby towns of Plymouth and Conway in New Hampshire, East Barnet and Newbury in Vermont, and Fryeburg in Maine. Today, gardeners in Bethlehem can see with their own eyes the difference in the growing season between those towns and Bethlehem. It is thus not surprising to find occupation evidence in those towns and not in Bethlehem. The northern Algonquins depended more heavily on hunting than agriculture. A general practice was to establish a permanent village where a communal garden was grown. In the summer months the families would spread out from the village to specific family territories where they hunted, fished, and gathered wild foods. The territories were strictly adhered to by various families or groups, and it is reasonable to assume that Bethlehem had such a group spending the summer within its boundaries. It could be said that the Indians were our first summer tourists.